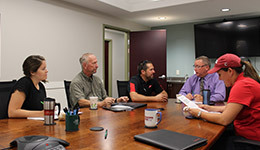 Jefferson County Agricultural Coordinator meets with staff from Cornell Cooperative Extension of Jefferson County, Harvest NY Staff and Pro-Dairy From Cornell University to discuss drought response. 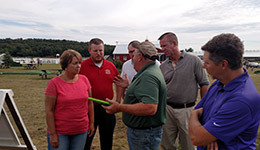 NYS Senator Patty Ritchie visited North Harbor Dairy to learn the extent of damage from the drought from owner Ron Robbins. J.J. Schell from Cornell Cooperative Extension of Oswego County; Terry Wilbur County Legislator from Oswego County; Scott Gray, Chairman of the Jefferson County Board of Legislators and Pat Jareo, member of the Jefferson County Board of Legislators look on. Information on Emergency Farm Loans from USDA. Includes links to Loan application Forms. A link to the USDA Farm Service Agency State Office website. The local USDA Office phone number is 315-782-7289. Website for buying and selling hay. Pricing Drought Stressed Corn Silage. Check in with Cornell Cooperative Extension of Jefferson County Agricultural staff for technical assistance with crop or cattle issues at 315-788-8450. The Northern New York Regional Ag Program Team is also available through the local Extension Office at 315-788-8450. The Jefferson County Soil and Water Conservation District has Geographic Information System Maps with Aquifer overlays. Contact them at 315-782-2749 for more information. The State Climate Office of North Carolina website shows a map with drought severity information. On left side click on zoom to state and then select New York and hit submit. The United States Drought Monitor Map for the Northeastern US.